Waking up in Sukadana for me is an auditory adventure in itself. From the distant rainforest the exotic siren-like whoops and howls of the kelempiau, the White Faced Gibbons, drift through the mist into my window. Closer by, the cheerful, bubbly song of the Yellow-Vented Bulbul perched outside in shrubbery contrasts with the surprisingly loud, harsh croaking of the Cik-Cak gecko in the rafters above my head. Suddenly a new sound begins: the powerful soul-stirring wail of human song: the morning “Call to Prayer” coming from the village mosque. Volunteering for Health In Harmony at ASRI in Sukadana, Kalimantan, south west Borneo is indeed an adventure experienced on many levels. First and foremost the interactions between staff, volunteers and local community members are rich and wonderful. The core values of ASRI are evident everyday. A spirit of openness, kindness and inspiration pervades the atmosphere providing a sense of common purpose and community. It is said that the way a culture treats its children is a measure of the health of the society. In Sukadana, due in no small part to ASRI's work, the children are happy. Smiling and laughter is the norm. 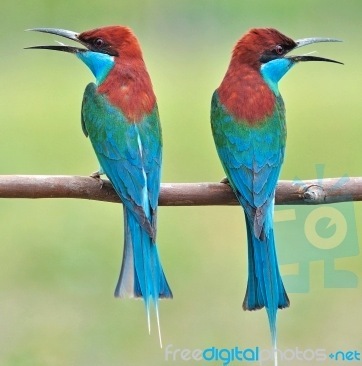 Some of the birds local to Sukadana (pardon the stock images - but they are beautiful, aren't they?) From left to right: Orange-bellied Flowerpecker; Red-crowned Barbet; Black-thighed Falconets; and a pair of Blue-Throated Bee Eaters. At 8:00 a.m., I join the doctors, nurses, dentists, pharmacist, other volunteers, the cook plus individuals in charge of community outreach and ASRI Kids, Goats for Widows, reforestation, sustainable agriculture and organic farming, and the drivers, for morning meeting where all members are treated as equals in this grand collective effort. After the joking and laughter subsides one person begins until all who wish to speak are finished. What a great sense of communal purpose! Funny, too when attempts at translation to and from Indonesian and English end up with hilarious results! I was fortunate to be able to volunteer in Sukadana November of 2011 and again in 2012. As a residential Architect I assisted in designing the plans for the proposed new community health center and the physical therapy room, specifying its equipment and developing a scheme for handicapped access ramps and entryway approach. Although my profession is architecture, it is my passion for ornithology that brought me to ASRI where someone was needed to identify and count the bird species on the Laman Satong reforestation site that is located in a more remote inland area about an hour from the clinic in Sukadana. The number of birds and number of bird species present in a tract of land is widely recognized as an important indicator of the health of its ecosystem. The site, which had been clear-cut of almost all trees in 1998, is managed by ASRI in order to do research on reforestation efforts over time. 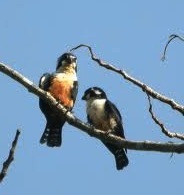 The site is adjacent to magnificent, old growth rainforest that contains over 200 species of birds. After the clear-cut, a pitiful number of plants, trees and birds remained. My job has been to learn whether after 2009, at the lowest point, there’s been a change. Me with my binoculars, ready to go! When I return, my home away from Sukadana will be a primitive two room roadside bungalow which is surrounded by a large yard where hundreds of tree seedlings and starter trees are propagated under net covers. I am up before daylight to assemble my gear for the morning count. Wearing my rubber snake boots, armed with binoculars and sound recording equipment I spend the early morning hours in the field recording bird sightings. Upon my return to the bungalow for lunch the staff of about a dozen workers, wonderful young people from the locale who are busily transporting starter trees in wheelbarrows greet me. These kids show such a happy collective spirit - I sense that they are very pleased to be thus employed. Their director, Johny, a quiet, bright and conscientious young man in his thirties with a twinkle in his eye, has but an eighth grade education yet he carries out a multitude of responsibilities. He is learning English as I am learning Indonesian. We practice together. Kinari Webb’s initial model for ASRI of providing desperately needed medical care in exchange for saving the rainforest by reducing illegal logging is succeeding and expanding in exciting new ways. In a world where cause and effect are often abstracted and obscured, I suspect that every volunteer at ASRI feels that, working in this transparent, no frills, hands on organization he or she is making a difference – a very satisfying and fulfilling experience. Ensuring that Health In Harmony keeps volunteers like me and so many others in the pipeline and available to meet ASRI’s medical and conservation challenges is also a critical component of this successful model. With the fabulous on-site help of the effervescent Etty Rahmawati, ASRI’s Conservation Outreach Manager, and Health In Harmony’s dedicated Kari Malen, International Volunteer Director, volunteers are treated to a unique, inspiring and truly meaningful experience. Help us keep our volunteer program effective and resilient. Please make a donation today to help the volunteer program so it can continue to flourish! Chris is an ornithologist, architect, and volunteered at ASRI multiple times with the conservation program.